On the other hand, he apparently dares not joke about his role in ushering in an ever deeper era of American decline. Hillary Clinton's apparently too busy pimping campaign bumper stickers to notice what's happening in Baltimore. Six hours after the bumper sticker tweet, Clinton did manage to cough up this. Then again, it seems to come down on the side that the rioting is at least somewhat justified. There's still time to insulate yourself a little more from the mounting tide of bad news, time to dig a little deeper in your figurative personal foxholes. America is in an ever steeper rate of decline. If you're depending on government to be the one to turn things around, you're screwed. It's government that orchestrating the decline. Even if it only means retreating as far as the backyard. Popular camping practices seem to have changed a bit in recent years, and hammocks have soared in popularity. 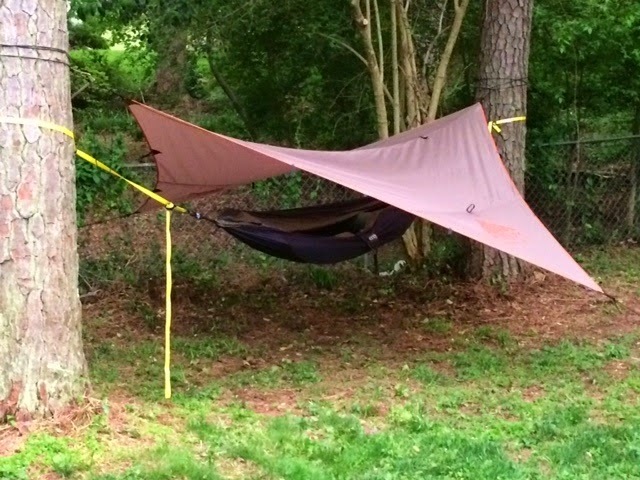 I'm new to hammocks, so I'm doing some experimentation, and used this combination last night. It's a Kelty 9-foot Noah's Tarp over an ENO doublenest hammock. The tarp's mostly a "putty" beige color that's similar to pine bark, but my camera and fading sunlight seem to have captured both the tarp and the tree in a funkier hue. I have a set of Atlas straps, but last night I chose to hang the hammock with a couple of cheap cargo straps from Harbor Freight. Using a 20-percent off coupon, the Harbor Freight straps cost me about nine bucks. I lined the hammock with a USGI foam sleep mat, and pulled a wool blanket over me to keep warm. Temps were in the low 60s overnight, and the set-up was real comfy. Had a few rain showers overnight, but had no water on the hammock. Are you old enough to remember when people mowed their own lawn, did their own home repairs, and managed to handle "pest control" at home on their own as well? Don and I explored some of these topics on last Friday's podcast, though we did open up the program with discussion of Hillary Clinton and some new entanglements recently revealed.